With over 50 years of experience in the manufacture of Coated Abrasives our knowledge in slitting, making and joining all sizes and grades of abrasive belts is unparalleled within the industry, and with more and more customers insisting on using SAIT products we’ve had no option but to invest further into our already successful UK Conversion facility, meeting the ever increasing demands of the market and our customer’s requirements. 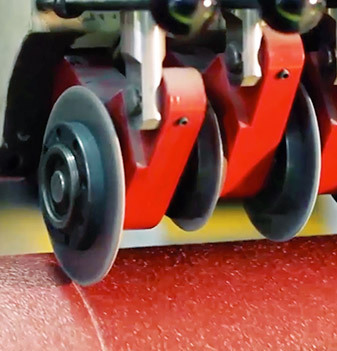 Based in Leicester we’ve established ourselves as service leaders in the UK abrasives market, producing an extensive range of standard and bespoke abrasive belts to suit every application. Our UK facility can handle large jumbo rolls up to 1600mm wide in both paper and cloth, which not only offers a service that our competitors can’t match, but a range of products that exceed our customer’s expectations. With such an extensive range of products we offer support that is unrivalled by our competitors. With ten field based Territory Managers we offer solutions to every application, ensuring that you’re using the right product for the process, that the requirements and goals are achieved and most importantly, in a cost effective and safe way.